This is a guest post by Elliot Martinez. Would you like to avoid social media blunders? Many companies treat social media like it’s the Internet version of a bullhorn. They post announcements on Facebook, LinkedIn, Twitter, and other sites, but that’s the end of it. They never spend time reading replies; they never post follow-ups; they never take advantage of the social aspect of social media, and that defeats the entire purpose. This year however we did see a more concentrated effort by larger companies to be more interactive with their followers – albeit most of these resulted in a failed effort. A perfect example of this is recorded by J.P Morgan Chase. They became brave and opened up a Twitter Q&A session with followers. In this J.P Morgan asked people to tweet with the hashtag #AskJPM for career advice and a chance to speak directly with a top executive. It is safe to say this hashtag campaign backfired, tremendously. And yes as you could imagine JPM was forced to come with a quick reply and some PR control. This is where the human aspect of social media came into play. Although JPM failed in this, at least they were able to recognize the fact and re organize a social media strategy, staying far away from that hashtag campaign. Recognize that social media requires a back and forth effort. It isn’t there for you to blast the internet with news. The smartest companies use social media to start conversations. You can address the issue by making sure you have a social media expert on staff. Even small businesses need someone who can take time to communicate with customers online. If you don’t have a social media expert on your staff, then you’re missing an opportunity to form relationships that encourage customers to think about you and turn to your business when they need something. To simplify things for your social media manager you can use a customer support tool like Kayako that integrates both social and other forms of customer support. It can be used to communicate with your customers through Facebook, Twitter, live chat and email from the same place. It also makes it possible for your social media management and customer service teams to work together and offer better support. Frustrated consumers often use Twitter and other social media platforms to air their complaints. A lot of companies don’t do anything when they see these negative comments. According to some research, only 29 percent of people who used Twitter to post a complaint got a reply. That’s a lost opportunity for businesses to correct problems, improve customer relations, and boost brand awareness. Ignoring those negative comments is also a good way to lose customers while developing a negative reputation. This year we saw a huge mistake by Home Depot doing exactly this – ignoring not only negative comments but every comment after posting this very controversial twitter post (in the screenshot below). This is a perfect example to further explain the importance of the social aspect in social media. Now take a look at this response (in the screenshot below) to all the negative comments, it might have even proved better to actually ignore them. You can keep up with customer comments by giving your social media team, tablets that make it easy for them to respond at any time. Choosing which tablet is best is the first step towards addressing this problem. When you have the right tools at your disposal you will be ready to handle anything that comes your way via social media. Then you need to make sure that your employees know how to respond appropriately. It’s important to think about your brand and campaign ideas thoroughly. Try out ideas that serve a greater purpose for engagement over time as opposed to a single shot effort. There are several large and small companies doing this very well. RedBull is notorious for social media management and recently Hot Pockets has attempted a rebranding campaign using YouTube videos, twitter hashtags, and Facebook information to garner excitement. Different types of conversations require different modes of communication. Think about it this way: you probably don’t speak to your boss the same way you speak to your employees. It’s almost like you use several different languages during the day. The one you choose depends on whom you’re speaking with. A great example is the use of hashtags on Facebook. The social networking site decided to use this tool (following lead by Twitter) to drive more conversation and centralize search for users. While the idea is a good one, Facebook users have not adopted the hashtag well and for brands to be effective they must communicate properly – and know the difference between an effective placement and a placement just to fit in. The same goes for social media. You shouldn’t use the same tone when posting on LinkedIn as Facebook. Unfortunately, a lot of companies don’t understand the difference. Here are some social media statistics you may find surprising. Use these statistics to improve your social media strategy across all your networks. Those companies often post the same information on all of their accounts. That can feel oddly inappropriate to many readers. It can also make your messages look like spam. (Who wants to see the same message posted a half-dozen times?) Tailor your updates and consumers will respond. Spend some time reading what other companies post on sites like Twitter, Facebook, and LinkedIn. Eventually, you’ll get a feel for what types of messages work on each platform. You should also spend more time crafting messages for different services. Never post the same message on multiple sites. Write each one independently. Google Plus is a great recourse for small business to create a social presence and for larger companies to reach an untapped market. This service has not been adopted for mainstream social media strategies, but some larger companies are using Google + and with great success. Ford Motor Company posts daily on Google + and has a following of over 3 Million. Ford uses their Google + page to post YouTube videos and other content that they may leave out elsewhere. This is hugely effective. Whether your company is large or small, learn to take advantage of social media and tailor your message with every platform, this will help you gain better engagement overall. You want a lot of people to follow your company online. That’s a given. A lot of organizations, however, never give people any incentive to click “like,” “follow,” or “share.” they just expect it to happen. Let’s take a look at what a brand did on Facebook that resulted in a complete fail. Remember the goal for brands is to drive engagement from consumers, too often companies pressure people for engagement and this never works out well. 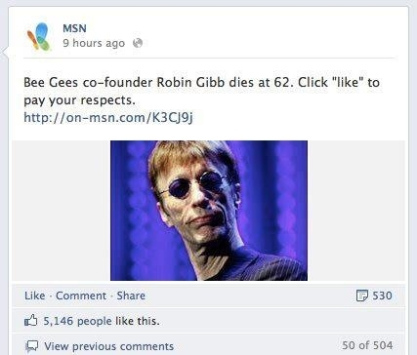 Here is a look at what MSN did to drive engagement and earn a “Like”, and yes this was not received well. We see these types of posts by companies often and they are a very generic way to involve your audience. Social media allows brands to take calculated risks and be creative – these types of posts seem directional and while the engagement is there it can carry a heavy double meaning for MSN. Start by asking yourself why anyone would follow your company? Do you expect them to do it just because they love the products and services that you offer? If that’s the reason, then you’re not making the most of social media. Offer your followers sneak peeks, discounts, fast responses, and engaging content. Those things encourage people to follow your company. If you don’t give something back, then not many people will care enough to follow you. Elliot Martinez is a business graduate of the University of South Florida and currently working towards his graduate degree. He is working as a freelance writer and covers all tech topics and anything business.